THE USUAL SUSPECTS – While those who committed the media crime of the century still skulk about, an unhappy band of pilgrims continues to make an annual commitment to a graveside vigil. When Government will act with true vigour and despatch is anyone’s guess. However, those who were in Opposition then – who clamoured for the unmasking of the assassins – have fallen silent before the pressures of realpolitik. More’s the pity. There’s a price to be paid for such a lack of integrity. In two sunrises from today, a regular graveside vigil which has become a ritual of sorts will take place for the eighth year running. It is the late slain Sunday Leader Editor Lasantha Wickrematunge’s memorial; now religiously commemorated on 8 January by still-grieving family, a few faithful friends, and not a few opportunistic politically-minded hangers-on. 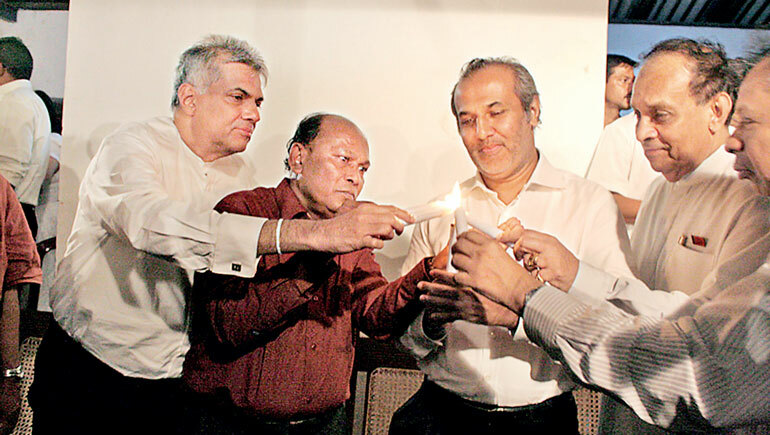 Each year I receive an email reminder from a loyal vigil organiser, saying something like: “Let’s gather at Lasantha’s graveside at Borella Kanatte at such and such a time to mark the umpteenth anniversary of his murder.” But I have been only once – the 8th of the so-called January Revolution. In the eight years since the brutal daylight assassination of someone who has become an iconic media figure, both by design and by default, only a handful of loyalists faithful to the principles of media freedom and close personal friends of the warm human being known and loved by many have chosen to remember him for the right reasons. In the span of time, successive governments and their apologists have swung between hell-gate and heaven-gate: then denouncing the criminals who shamefully commissioned and carried out the killing; now defending their lack of progress on identifying and punishing the culprits. Each year the customary email appeals to all friends and family members to please inform all past staff at The Sunday Leader, to say nothing of present cadre who know the man by name and reputation only. And using a lovely Sri Lankanism, the graphics desk of the Leader is asked to “please do the needful” to ensure that the big picture of Lasantha – as iconic now as his posthumous editorial allegedly from beyond the grave – will be there. It is as much for public consumption, to galvanise support and sympathy for a just cause, as a memento mori in personal grief. Those who can bring candles and flowers are requested to please bring some. No pains are spared to contact and inform those who worked with them in their respective departments at TSL under LW’s watch, as well as anyone else who would want to be there. The ‘usual suspects’ star in the graveside vigil. The memorial service customarily starts off with one of Lasantha’s close childhood chums leading the remembrance in prayer. This is followed by an elder statesman in the media fraternity and a more recent alumna of the Leader, speaking a few words in memoriam. Anyone else who wishes to speak is made to feel that they are welcome to do so – the rationale being that “it would be great to remember Lasantha through individual memories of him on this day”. Then Lasantha’s family members will light candles and place them on his final resting place; followed by the faithful few who have gathered to grieve, mourn, start a movement against media-targeting crimes, give vent to rage… whatever. In eight years since the gunshots that were heard around the world, no more than a hundred people a year gather around the grave – all told less than a thousand in eight long years of silence and conspiracy theories and unfulfilled promises and muddling through the mire of machangfying with the murderers in the Government corner of the Graveyard that is Sri Lanka’s political wasteland. It remains to be seen if the entire absence of significant progress made in this sensitive case is simply a wobble on the road to bringing the wrongdoers to account – Or whether the wheels are coming off the bandwagon of Good Governance. It has been said in these columns many times. But there is value in repetition in the face of apathy and a lack of progress. Even if the cynical observers might smile and some silent naysayers may laugh at the folly of doing the same thing again and again in the face of results and expecting something to change. So here goes. In hope that someone, somewhere, would see that this among many other emblematic issues for the incumbent regime – simply because they have visibly taken the high moral ground on it and now run aground on realpolitik’s muddy minefield – will make or break public confidence in the present dispensation. NAÏVE: Procedural obstacles (law’s delays, lack of evidence) has hampered the progress of investigations. NICE: The powers that be are still resolute in their determination and commitment to unmask the assassins. NORMAL: It is ‘usual form’ for even the most well-intentioned governments to come a-cropper on the rocks of politics in the real world, no matter what their ideals on the campaign trail were… So, do shut up! NATURAL: Folks shouldn’t get too hot under the collar about nothing being done or being seen to be done except a spate of low-level arrests and much ado about exhumations. Because using emotional flashpoints to leverage political advantage is par for the course in realpolitik. NASTY: Good Governance was just a – another – campaign slogan. The people have been gulled into accommodating a – another – regime of the same self-serving stripe. Do your best to forget the offence, for nothing good can come out of these Nazarenes; if not as bad or brutal then as barefaced and balderdash-dishing-out as the previous Gadarene swine. NAUGHTY: The powers that be – to say nothing of the police and other branches of the law in the land as well as the military – know who did it, how, and why. But in the interests of the coalition’s future – or maybe more accurately to safeguard a grand old party’s presidential prospects – the investigation cannot be expedited because it would scupper the career of a generally martial servant of the people whose services have been marshalled for the political field. Can the naïfs among the shouty-types and the sabre-rattlers please realise that it is in everyone’s best interests (but not of family and friends, of course, to say nothing of abandoning a principle and abrogating a promise) TO LET THIS GO! NECESSARY: Even now – especially now – the precariously poised coalition (power struggles within, image management issues around, electoral contests ahead) can – and/or must – salvage its reputation, right to govern, responsible ambition to remain in power, by prosecuting the slain senior journalist’s persecutors with alacrity and dispatch … If it means sacrificing one political hopeful for another less reliable prospect, so be it – There is more to winning an election that is at stake here… Sri Lanka’s credibility as a decent country, civilised ancient land, modern political economy with a future, hangs in the balance. LW’s mourners will gather two sundowns from today’s to offer an elegy for the dear departed. GG’s eulogisers – that happy band of hypocrites – will probably be there, their political posses in attendance at a grave vigil for Good Governance. Here’s hoping that the mourners as much as the false friends and fiends alike have an epiphany. Now’s the time to realise that the turning point of LW’s investigation and GG’s integrity have both come together. If the familiar graveside vigil is a matter of mere sentiment, may flights of angel hymn LW to his rest… the rest is silence – and Good Governance can go home to a city lunch after a morning spent among true mourners in a country churchyard, elegies and all. But if there is a principle involved – the keeping of promises made, and living up to pledges to people who are not beguiled lightly – GG had better come clean or act swiftly to cleanse the Augean stables it once abhorred itself. More to the point than one mystifying murder mystery still unsolved is the Government’s attitude to media in general and hostile or critical media in particular. As recent events have shown, it is but a step or a slip from the CID-, TID-driven, high moral ground of pointing fingers at everyone except those – or he – who DID it >to the gangway of press-ganging journalists doing their job >to a whole new (old) political culture in which “those who are not for us are against us” – and thence to the slippery slope of death! to all traitors! and non-patriots! so there! Am I exaggerating the egregiousness of it all? Maybe, folks! But be that as it may, no more than the puppeteers who pontificate on the goodness of the dead… or the elegiac quality of his post-mortem prose in that allegedly posthumous editorial. While propagandists on all sides of the multifaceted killing (business, politics, pleasure) jockey for advantage, LW’s body lies a-smouldering in the grave – right next to GG’s effigy. Realpolitik has been an epiphany for us all. Rest assured the wicked dead will return to haunt us for it until the peal of judgment bells – or a judge finds LW’s murderers guilty, and they’re sentenced by law, not the jury of speculation or the court of public opinion any longer.